I came back from the store with a big bunch of fresh peaches. It’s warm outside and I’m in a festive mood – peachy in fact – why not kick back on the front porch with a homemade peach smoothie? Peel, pit, and slice the peaches. 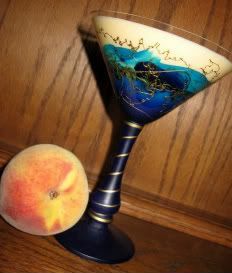 Blend the peaches, yogurt, jelly/juice, and rum in a blender until smooth. Pour into a festive glass and enjoy! A smoothie is often a breakfast, so I will surely enjoy trying this one, maybe without the rum early in the morning! Yum! I am going to miss the summer peaches - my a favorite fruit.